Compensation adjustments for city staff. A meeting of the Fayetteville City Council began at 5:30 p.m. Tuesday, April 2, 2019 inside room 219 of City Hall, located at 113 W. Mountain St. in Fayetteville. Notes: Becker said the city got off to a rocky start in January, but sales picked back up in February. While sales tax is down slightly this month, he’s not concerned at this time. 1. Opposition to Senate Bill 550: A resolution to express the City Council’s opposition to Senate Bill 631. More info: City attorney Kit Williams said the bill would remove the city’s right to regulate developments using its tree protection and preservation ordinance. Mayor Jordan said he thinks the bill is just as bad as proposed Senate Bill 550, which the council voted unanimously to oppose last month. “This basically, to me, is nothing more than a tree slaughtering bill,” said Jordan. 2. Wings Avionics, Inc. (Details): A resolution to approve a three-year lease agreement with Wings Avionics, Inc. for the airport hangar at 421 Ernest Lancaster Drive for rent in the amount of $1,649.38 per month. 3. Atlas Interiors, LLC (Details): A resolution to approve a one-year lease agreement with Atlas Interiors, LLC for the south side of the corporate hangar located at 4166 S. School Ave. in the amount of $850.00 per month with a requirement to provide certain minimum aircraft maintenance services. 4. Laser Specialists, Inc. (Details): A resolution to award Bid #19-23 and authorize the purchase of a RTK GNSS System from Laser Specialists, Inc. in the amount $18,420.00 plus applicable taxes to be used by the Engineering Division for in-house engineering design work. 5. Southwest Park Land Dedication Funds (Details): A resolution to approve a budget adjustment in the amount of $12,478.00 recognizing park land dedication fees from the southwest park quadrant to be used for the purchase and installation of two 20-foot shade umbrellas at the Wilson Park Swimming Pool. 6. U.S. Department of Housing and Urban Development (Details): A resolution to approve the renewal of four Special Needs Assistance Program grant agreements with the U.S. Department of Housing and Urban Development in the total amount of $283,976.00 for the city to administer programs to assist homeless Fayetteville residents. 7. Williams Tractor, Inc. (Details): A resolution to authorize the purchase of a New Holland 260 Speedrower from Williams Tractor Inc. in the amount of $142,130.00, pursuant to a Sourcewell Cooperative Purchasing Contract, for use at the Biosolids Management Site. 8. Insituform Technologies, LLC (Details): A resolution to approve a one-year contract extension with Insituform Technologies, LLC in an amount not to exceed $528,693.55 for rehabilitation of sanitary sewer mains using cured-in-place sanitary sewer linings and approval of a contract amendment to exchange the professional engineering endorsement to new city staff. 9. A.I.T. Services, Inc. (Details): A resolution to accept a quote in the amount of $47,745.00 plus applicable taxes from A.I.T. Services, Inc., for the replacement of the fill auger assembly and exhaust scrubber-condenser assembly on the Biosolids Management Site thermal dryer system, and to approve a budget adjustment. 10. McClelland Consulting Engineers, Inc. (Details): A resolution to approve Supplemental Agreement No. 2 to the contract with McClelland Consulting Engineers, Inc. in the additional amount of $18,082.00 to add final engineering design and bid services for the replacement of an existing 24-inch water main adjacent to Morningside Drive associated with utility relocations necessary for Arkansas Department of Transportation Job 040579. 11. Riggs Power Systems (Details): A resolution to authorize the purchase of a replacement emergency back-up generator from J.A. Riggs Tractor Company in the amount of $26,965.00 plus applicable taxes, pursuant to a Sourcewell Cooperative Purchasing Contract, for use at the Futrall Drive Lift Station. 12. J.A. Riggs Tractor Company (Details): A resolution to authorize the purchase of a replacement emergency back-up generator from J.A. Riggs Tractor Company in the amount of $102,545.00 plus applicable taxes, pursuant to a Sourcewell Cooperative Purchasing Contract, for use at the Farmington Lift Station, and to approve a budget adjustment. 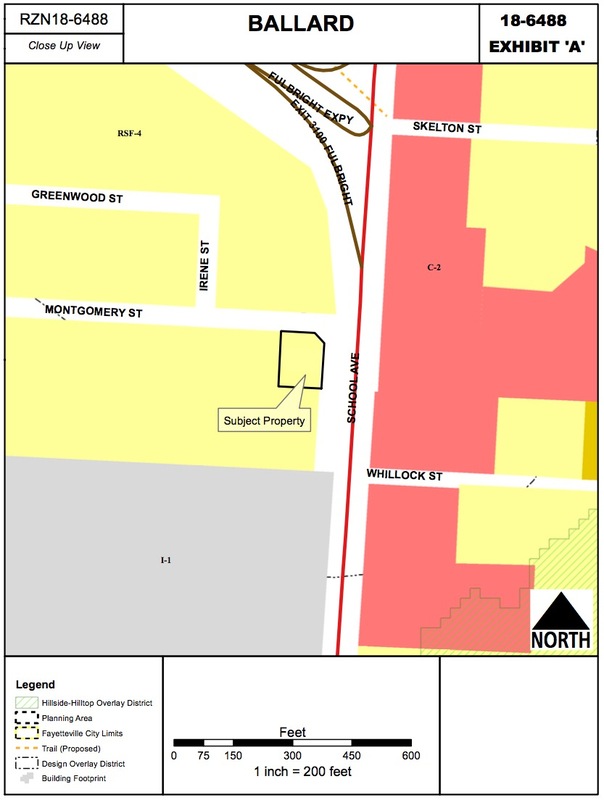 An ordinance to rezone that property described in rezoning petition RZN 18-6488 for approximately 0.42 acres located at 825 W. Montgomery Street from RSF-4, Residential Single Family, 4 units per acre to NS-G, Neighborhood Services General. This item was left on the first reading on Feb. 19, and then left on the second reading on March 5, and then tabled on March 19. The applicant originally requested the property be rezoned to RMF-6, so that the property could be developed with duplexes. City staff were against the request, and said it was out of character with the nearby established neighborhood. After its first discussion, the Planning Commission asked the applicant to revise the request to instead seek NS-G, Neighborhood Services General. The applicant agreed, and the Planning Commission unanimously approved the request. City staff are still recommending denial, and said NS-G would also be inconsistent with the form of the older neighborhood. Staff said the applicant indicated they want to build two duplexes on the property. The current zoning would allow one duplex with a variance, but if the land were RSF-8, two duplexes would be allowed with a variance. The applicant did not ask for RSF-8, but staff said they mentioned it tonight because it’s another way to get what the applicant wants that could possibly appease the neighbors who are against NS-G.
Smith said he’s read comments from several neighbors who said they want to keep the neighborhood full of only single-story homes. He reminded the neighbors that the current zoning already allows homes to be built up to three stories. Petty said he said a smart developer would include a Bill of Assurance promising that only two duplexes would be built on the land, but that’s not what’s in front of the council tonight. Regardless, he said he’s inclined to approve the request because he doesn’t think it poses a potential problem for the area. During public comment, a woman who lives near the property asked the council to vote against the request. She said NS-G would allow businesses to be built right at the entrance of her 31-home neighborhood. She listed several types of businesses that are allowed under NS-G that she and her neighbors don’t think are appropriate next to their homes. Council member Gutierrez said she’d like to hold the ordinance on the first reading. The council agreed. Petty said after thinking about it, he would prefer the originally requested RMF-6 zone, and said he’s not sure NS-G is appropriate at this time. Kinion agreed. Staff said the applicant was told about Petty’s suggestion of a Bill of Assurance, but hasn’t yet filed one. Scroggin said if there’s a chance a Bill of Assurance is coming, he’d like to wait another two weeks before making a decision. Gutierrez said she’d also like to wait to make sure the right decision is made. Five residents spoke against the request. Most said the area doesn’t need an increase in density. The developer has provided a Bill of Assurance that restricts the height to two stories, limits the use to single-family homes or duplexes, and establishes a 15-foot setback. The developer also said they’re willing to go back to the originally requested district of RMF-6, which would limit development to two single-family homes or duplexes. A resident who spoke said he’d be fine with two single-family homes, but has concerns about the traffic and additional vehicles parked on the property if duplexes were built. Another resident said she would prefer a single-family-only district – like RSF-8 – to ensure that only single-family homes are built, unless a conditional use permit for duplexes is approved separately by the council at a later date. The council voted unanimously to amend the ordinance to include the Bill of Assurance and originally requested district. Council member Gutierrez is not here tonight, but asked the council to please not vote on this item yet. That would require a vote to table the item since it’s already on the third and final reading. The council voted unanimously to table the ordinance until the next meeting on April 2. The council started by passing (8-0) a brief amendment to include the Bill of Assurance that was presented at the previous council meeting. Four residents spoke against the proposed zoning, citing concerns about traffic safety, stormwater runoff, incompatibility, and a general disinterest in increasing density in the area. One person said it’s incompatible with the neighborhood, and could lead to more developers asking for multi-family zonings in the area. Another said if two duplexes were built on the subject property, those new residents might park their cars on the side of the road sometimes which could lead to a safety issue for school buses or emergency vehicles turning into the neighborhood. The city’s fire chief was asked whether fire trucks can navigate the street. He said they can, but if the fire marshal ever determines that cars are blocking the lanes, the city could restrict parking to just one side of the street. City staff said they don’t think the additional units will cause any parking congestion. Additionally, staff said the multi-family zoning district will allow regulations based on potential stormwater issues, which is something that’s exempted from single-family districts. The council voted 5-3 to approve the ordinance. Turk, Gutierrez and Kinion voted against the proposal. An ordinance to amend § 161.20 District R-O, Residential Office, § 161.21 District C-1, Neighborhood Commercial, § 161.23 District C-2, Thoroughfare Commercial, § 161.25 District C-3, Central Commercial, and § 166.24 Nonresidential Design Standards of the Fayetteville Unified Development Code to provide a form based development option for districts R-O, C-1, C-2, and C-3. The Planning Commission and its Long Range Planning Sub-Committee, as well as city staff, are all in favor of the ordinance, which would modify four conventional zoning districts to allow form-based development. Turk said she’d like more time to consider the changes, and asked the council to hold the item on the first reading. The council agreed. City Attorney Kit Williams said he likes this idea, but said it regulates the aesthetics of some non-residential uses that the city doesn’t have authority over, including churches, public schools and buildings owned by federal, state or county agencies. He offered an amendment that addresses this issue. For example, regulating how a church looks could be seen as violating that organization’s first amendment rights. Petty said he appreciates Williams’ intent, but said he’s skeptical that the amendment should be made. He said not all design regulations are simply about aesthetics. Windows are required in many cases, he said, for safety reasons. The same goes for many entrances, he said. He said there’s nothing in the current regulations that wouldn’t allow a church to distinguish itself as a religious institution, and he’s worried a blanket exemption for those types of institutions could open the door to undesirable or unsafe designs that are used in a disingenuous manner to save money. Williams disagreed, and said aesthetics are the primary reason for regulating design, even if those aesthetics help people see in or out of a building. He said federal, county and state agencies are not subject to city ordinances, so it would be improper to approve language that regulates those agencies. Petty said while it may be true that federal, state and county agencies should be exempted, he’s not convinced that religious institutions should be exempted. He said to violate their first amendment rights the city would have to be impacting their ability to worship. He said if a church wants to build something unsightly and claim it’s for a religious value, there must be some protection against it. Williams said even if a church claimed an unsightly design was faith-based, the council isn’t in a position to judge whether it’s true. He said he believes staying completely out of church business is the best way to go. Marsh said with a blanket exemption, it would be too easy for a religious institution to build something unsightly and then move out, leaving a building that doesn’t comply with the city’s standards. Marsh suggested tabling the item and sending it to the Ordinance Review Committee. Mayor Jordan said the same could be accomplished by leaving the item on the second reading. The council agreed. The discussion will continue on March 19. City Attorney Kit Williams said rather than trying to pass this tonight, he’d like the council to table the proposal to allow him some time to work on a few changes that have been requested. Mayor Jordan said he’d also like to spend some more time on it. The council voted unanimously to table the item until the next meeting on April 2. There’s still some disagreement over Williams’ concerns about regulating religious institutions. He said if the council were to pass the ordinance tonight in order to get the changes in place now, he’s willing to bring his concerns – and a proposed amendment – back at a later time. Turk asked if there’s any reason why this should be passed now instead of waiting until William’s issues are resolved. Petty said the sooner the better when it comes to giving developers new tools and incentives to build form-based buildings. The council voted 6-2 to approve the ordinance. Turk and Kinion voted against. 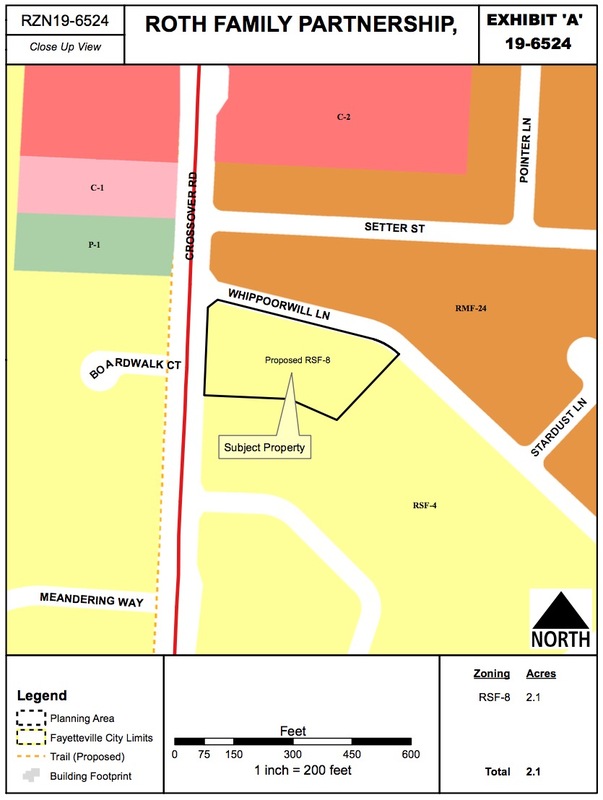 An ordinance to rezone that property described in rezoning petition RZN 19-6524 for approximately 2.14 acres located at 2827 W. Whippoorwill Lane from RSF-4, Residential Single Family, 4 units per acre to RSF-8, Residential Single Family, 8 units per acre. This item was left on the first reading on March 5, and then left on the second reading on March 19. Both city staff and the Planning Commission recommend approval of the request. Over a dozen residents spoke against the request. Some cited safety worries about increased traffic and added stormwater runoff. Some said more residences at the corner of Crossover and Whippoorwill would change the character of the rest of their neighborhood. Another said if approved, it would open the door for similar requests along Crossover Road. Others said they thought the homes that are built on this land would just become cheap rentals for college students. Marsh said the requested zoning for 8 units per acre is appropriate for the area. She said it’s on a major arterial roadway and is a good transition from the current 4 units per acre and the 24 units per acre immediately adjacent to the north. Scroggin said it might be wise to consider the potential stormwater issues before the discussion continues. Kinion agreed. Bunch said added affordable housing – especially in this area – doesn’t have to be the kind of run down rental properties some of the neighbors have expressed concerns about. She said the houses could be homes for senior citizens who are downsizing or families who’d like to enter the community but otherwise couldn’t afford it. Smith said one of the council’s duties is to help manage the growth of the city, and finding compatible places to facilitate more homes is part of that solution. He said when proposals for incremental increases in density across towns are ignored, the result is often monumental increases in other areas. Those areas, he said, tend to be lower income neighborhoods with residents who don’t have the means or political capital to fight against it. He said he hasn’t made up his mind about this particular request, but said solutions must be found for addressing growth and overall, he believes these incremental increases in density are a good start. Turk said she’s concerned about drainage and traffic safety along Crossover Road. She said she doesn’t want to add any more density to the area, and she won’t support the request. Gutierrez agreed. Petty said he’s not ready to make a decision about this project, and has some concerns about stormwater. He said he doesn’t want to trivialize safety, but said it’s not an issue that should be considered during this request because 8 units per acre along a major arterial roadway is not a problem. He said some residents complained the developer is only trying to make money, but said all neighborhoods are built by developers in a for-profit manner. He said he has deep concerns about climate change, and if the council has a single-family-exclusive mentality, then it is agreeing to ignore climate change. The council agreed to leave the item on the first reading. The discussion will continue on March 19. Since the last meeting, a lawsuit was filed against the potential developers by resident Brandon Cate on behalf of his wife, Laura, and their neighbor Christopher McGinnis. The lawsuit states that the protective covenants of the Glendale Addition don’t allow more than one home to be built on a particular lot. The city is not a party to the lawsuit, but Cate is expected to ask the council to table the proposal until the case is decided. A representative for the partnership said tonight the plan is actually to build houses in the $300,000-$325,000 range. It was previously stated that they planned to build homes at around $250,000 each. City staff were asked about the pond currently located on the undeveloped lot, and whether it has any advantages when it comes to stormwater drainage. Staff said it only captures about 1 percent of the total area’s runoff, but it does catch about half of the water from the immediate area since it happens to leak during dry weather. The developer has said that the pond would likely be filled, but that they would address runoff when designing any homes, and, of course, comply with any applicable stormwater requirements. Brandon and Laura Cate spoke to restate their opposition. Brandon asked the council to consider tabling the rezoning request until their lawsuit is decided, and spoke to environmental concerns he has about additional development on the Roth’s property. He said rainwater already causes water issues in the neighborhood, and the problems would only be worsened by more houses. Several other residents spoke to restate their opposition. Council member Gutierrez is not here tonight, but she asked that the item not be advanced to the third and final reading tonight. The council agreed. The discussion will continue on April 2. Eight residents spoke against the proposed zoning, and restated concerns voiced at previous meetings about traffic safety, stormwater runoff, incompatibility, and a general disinterest in increasing density in the area. Petty said he’s heard emphatic arguments over the past few weeks, but none that have compelled him to oppose the rezoning. He said the loss of the pond has given him some concern, but the current rezoning would already allow removal of the pond. He said it’s a reasonable request, and said modest increases in density are how the middle class competes on land prices. He said while struggling families might not be able to afford the types of homes that are planned on this land, smaller homes are relatively more affordable than the larger homes that would be built on the property under the current zoning. Turk said the neighborhood has been around a long time, and there are better places for modest increases in density, such as the 71B corridor. She said she has concerns about stormwater runoff, and she’ll vote against the ordinance. Kinion said the neighborhood was established using covenants and those rules should be preserved, regardless of whether the lawsuit prevails. He said he also has concerns about traffic safety and stormwater, and he’ll vote against the ordinance. Smith said it’s a tough decision because there is a lot of opposition to the request, but he thinks it’s a reasonable proposal. He said whether the new homes are affordable to everyone or not, they will allow someone to move up and another to move in. Smith said until everyone can figure out how to all share some of the burden of making room for a growing population, the only place to add density is at the edges of the city. He said he’ll likely vote in support of the request. Gutierrez said it’s not a tough decision for her. She said she supports density and home affordability, but said there’s no guarantee that the homes will be affordable. She said she’d rather see density near the 71B corridor. Marsh said the request is appropriate for the area, and a modest increase in density is compatible with the neighborhood. She said the stormwater runoff in the area comes from the existing homes, and suggested residents up the hill add some low-impact design elements into their properties if they’re concerned about the properties below them. She said it’s a great proposal and she’ll be in support. Bunch said smaller homes give aging residents a more affordable option for a home that requires less maintenance. She said the new homes that are built will allow multi-generational living in the area, which she said is a good thing. She said still hasn’t decided on how she’ll vote. Scroggin said the area is ripe for an increase in density because of its proximity to the intersection of Mission Boulevard and Crossover Road. He said he’d like to see the pond stay on the property, but it doesn’t seem like an option regardless of the zoning. He said he’s in support of the ordinance. The council voted 4-4, so the ordinance failed. Turk, Gutierrez, Kinion and Bunch voted against. Mayor Jordan is allowed to cast a vote, but he declined. 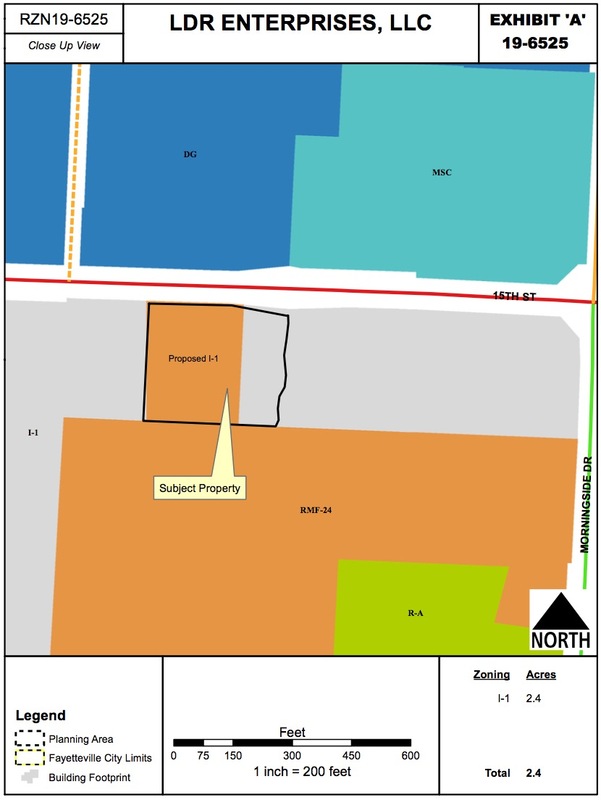 An ordinance to rezone that property described in rezoning petition RZN 19-6525 for approximately 2.37 acres located at 509 E. 15th Street from RMF-24, Residential Multi-Family, 24 units per acre to I-1, Heavy Commercial & Light Industrial. This item was left on the first reading on March 5. It was voted down on March 19, but then brought back after the vote. Marsh said the requested zoning is compatible with the area, but said she’d be more comfortable if a Bill of Assurance were provided that promised there would be no underground storage tanks constructed on the property since the majority of it is on a floodplain. Staff said any large-scale development would be subject to water quality standards. Marsh asked to leave the item on the first reading. The council agreed. The discussion will continue on March 19. There was no public comment, but Turk asked staff if the requested zoning would allow a gas station with underground storage of fuel. Staff said yes, that use would be allowed. The council advanced the item to the third reading, but voted 3-3, meaning the item failed since it needed 5 affirmative votes to pass. Kinion, Smith and Turk voted against. After the vote, Kinion moved to reconsider. He did so in fairness to the applicant, since there were two members absent, one who represents this particular ward (City Attorney Kit Williams suggested this action). Smith seconded the motion, and said while he won’t likely change his vote, he did want to give the other members a chance to weigh in. The discussion will continue on April 2. Williams said after the previous meeting the applicant has offered a Bill of Assurance which states that underground storage tanks (such as for a gas station) will not be built on the property. The council voted to amend the ordinance to include the Bill of Assurance. The applicant said the property is difficult to build upon, and will likely become a small warehouse with an office. Smith said because of the Bill of Assurance, he’s now in support of the proposal. An ordinance to amend §166.04 Required Infrastructure Improvements – Development In City Limits of the Unified Development Code to change the park land dedication ratio for multi-family dwelling units and the fee-in-lieu formulas for single-family and multi-family dwelling units related to park land dedications. This item was left on the first reading on March 19. The formula for the number of occupants in single-family dwelling units would change from 2.32 to 2.31 based on data from the U.S. Census. The formula for multi-family units would change from 1.39 to 2.02 occupants. The formula for the average cost per acre of raw land would change from $40,000 per acre to $47,130 per acre. Both city planners and the Parks and Recreation Advisory Board are in favor of the changes. The council wanted to wait before making this decision, since it would effectively raise the rates for developers moving forward. The item was left on the first reading. The discussion will continue on April 2. Petty said he thinks the park land fees should be paid later in the development process to avoid a developer being charged twice if a site improvement plan is presented. He suggested having the fees apply when seeking a certificate of occupancy is a better time than when the project is originally platted. Williams said he agrees that the timing needs to change, and that he plans to bring an option back to the council in the future to address that potential issue. Petty suggested taking a bit more time with this item to ensure it’s correct. Marsh said she’d like to send the proposal to the Ordinance Review Committee. Smith moved to table the item until the committee can meet, but Williams interjected and said he’s currently working through a specific situation with a developer that would be more easily resolved if these changes were passed tonight. He said he does plan to bring an option back to the council to address Petty’s concerns. Petty said he’s in favor of park land dedication fees, but said the ordinance needs more time. He said it currently incentivizes very large apartment complexes instead of the types of developments the city wants to see, and needs to be revised now. The council advanced the ordinance to the third and final reading, and approved it by a vote of 6-2. Petty and Scroggin voted against. An ordinance to waive competitive bidding and accept a quote in the amount of $12,830.67 plus applicable taxes, from Electric Motor Center for the repair of four aerator mixer motors at the Noland Wastewater Treatment Facility. City staff said in recent years the 30-year-old aerator mixer motors sometimes required over-haul corrective maintenance. In this case, four mixers were shipped to Electric Motor Center in Springdale for disassembly and repair inspections. It was determined that the parts repairs that will cost $12,830.67. The council advanced the ordinance to the third and final reading, and voted unanimously to approve it. An ordinance to waive competitive bidding and accept a quote in the amount of $22,929.95 plus applicable taxes, from Electric Motor Center for the replacement of a rotating assembly and repair of a motor drive in an influent pump used at the Noland Wastewater Treatment Facility, and to approve a budget adjustment. Similar to the above item, the 30-year-old pumps are in need of repair at a cost of $22,929.95. An ordinance to amend §51.136(c) Monthly Standby Fire Protection Service Rates so that rates are based on the smaller of the incoming water line size or the backflow preventer, and to provide for biennial rate reviews instead of automatic annual rate increases. Staff said the current charges for unmetered service connections for standby fire protection and fire hydrants are based on the size of the water line entering a building. However, the actual water amount delivered by a fire protection system is limited by the smallest line size in the supply along with losses due to friction in bends and fittings. Since the incoming line may not be the smallest, staff said the charges should instead be based on the amount of water that can be delivered to the system which often may be the backflow assembly. Staff recommends that the current annual 3 percent increase per existing ordinance be discontinued and held at the 2019 rates when it pertains to fire flow standby fees. This lower charge, staff said, would better align Fayetteville with neighboring cities to be competitive for new development. An ordinance to amend § 166.23 Urban Residential Design Standards of the Unified Development Code to clarify the requirement for adequate space and screening of recycling and trash containers in new urban residential developments. Existing city code has a screening requirement in new urban residential developments, but it does not address the specific amount of space needed inside the enclosure. It has been the practice of the Recycling and Trash Division to ask commercial, office, mixed-use and large multi- family residential developments for the space needed to enclose two front end load dumpsters, 24’ wide and 12’ deep. This allows for a trash dumpster and an additional recycling dumpster. Staff said frequently, but not in all instances, developers constructing commercial, office, mixed-use and large multi-family residential developments have been willing to provide the space needed for two dumpsters. This change would make it a requirement to ensure that multi-family residential developments have the space necessary to provide recycling and trash services now and in the future. The council advanced the ordinance to the third and final reading, and voted unanimously to approve it. Petty stepped out of the room before the vote. 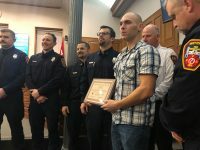 A resolution to approve the 2019 Fire and Police Pay and Benefits Study Report prepared by the Johanson Group, and to adopt the 2019 Fire and Police Step Pay Plans. In 2016 the City Council approved a contract for the Johanson Group to conduct a classification, compensation, and benefits study. In 2018, the council approved the recommendations along with a change order to conduct annual pay and benefits studies. The 2019 study is included in the agenda packet for this item and can be viewed here. A resolution to approve a budget adjustment in the amount of $1,830,000.00 to fund the city-wide 2019 employee compensation adjustment. The recommendation is a compensation package based on the fiscal results of 2018 operations and the Fire and Police Pay and Benefits Study recently completed. 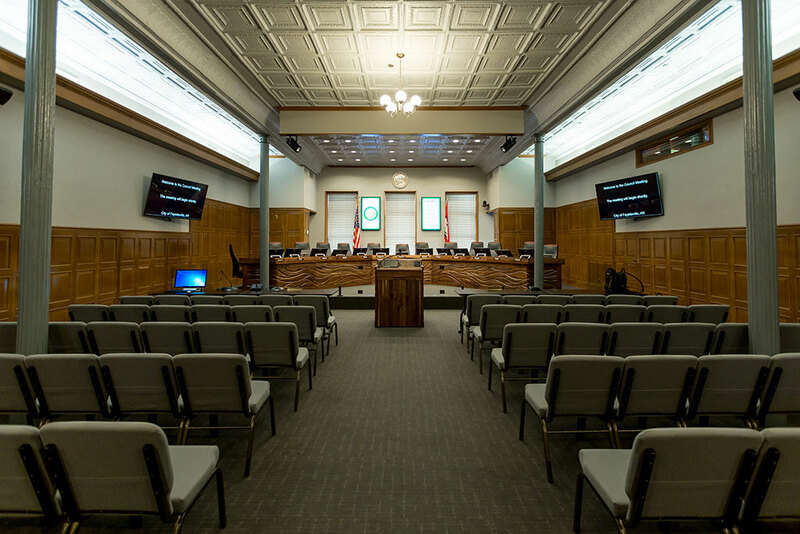 Staff said although the General Fund had a deficit in 2018 operations, it was caused by one-time capital expenditures from the previously budgeted TheaterSquared project. Other operating funds such as the Street, Parks Development, Water & Sewer and Recycling & Trash Collection funds have the capacity to afford these salary increases. The plan would provide an increase to Police and Fire uniformed personnel by placing them on the new step pay plan structure at their current step effective 3/25/2019. The plan would provide for a one step increase for eligible Police and Fire uniformed personnel beginning 3/25/2019 keeping everyone in a step. The plan would provide for merit increases for other employees comparable to the amount provided for a step to uniformed personnel, to be distributed based on merit (4.0% merit pools will be created for that purpose). Merit employees at the top of their ranges will be eligible for a single year service award which will not be factored into the employee’s base pay. Amounts to merit employees will be based on performance as determined by the appropriate department/division head. These increases will go into effect beginning 3/25/2019. To be eligible merit employees must have completed at least six (6) months of service which means they must have been paid on Pay Period #21, 2018 which equals a start date before 10/8/2018. Uniformed personnel to be eligible to receive a step increase must have completed at least one year of service which means they must have been paid on Pay Period #8, 2018 which equals a start date before 4/9/2018. The 2019 cost of this plan is projected to be $1,343,300 in the General Fund. The 2019 cost for all funds would be $1,830,000. The on-going cost of the plan in future years will be $1,840,000 for the General Fund and $2,508,000 for all funds. This meeting was adjourned at 9:24 p.m.